Fighter pilots, especially during times of war, are very much respected as they are admired. While volunteering to fly a fighter plane allows a pilot to get out of the muddy slopes and deadly terrain of the soldier, it makes them an easy target -rather too easy a target for anyone who wants to shoot them down. As such, those who bravely flew and shot down numerous enemy aircraft are often immortalized as heroes. One such man is Manfred Albrecht Freiherr von Richthofen - The Infamous Red Baron. Richthofen was a German fighter pilot who served under the Imperial German Army Air Service during World War I. With 80 officially credited air combat victories, Richthofen was considered the top ace of WW1 and rose to become a legend in the air, earning such titles as “Le Diable Rouge” (Red Devil), “Le petit Rouge” (Little Red), and “Red Knight”. Back when flying a fighter plane was almost like a death wish, Richthofen flew in a blazing red painted airplane and shot down plane after plane. In the air, even with his provocative red plane, he was not a moving target, he was a harbinger of death to his adversaries. The Red Baron was born in Kleinburg into a prominent Prussian aristocratic family, his father being Major Albrecht Phillip Karl Julius Freiherr von Richthofen and his mother, Kunigunde von Schickfuss und Neudorff. Even as a child, he already had an adventurous streak, often hunting wild boars, elks, birds, and deer with his two brothers. At school, he excelled at parallel bars and has won awards, and enjoyed both riding horses and gymnastics. At age 11, Richthofen already began his military training, completing cadet training in 1911 and joining an Uhlan cavalry unit, the Ulanen-Regiment Kaiser Alexander der III von Russland (1. Westpreußisches) Nr. 1 afterwards. In 1915, he transferred to the Air Service and became one of the first members of Jasta 2 in 1916. It was with Jasta 2 that he won his first aerial combat over Cambrai, France. Although not an aerobatic pilot like his younger brother, Richthofen was a notable tactician and squadron leader. 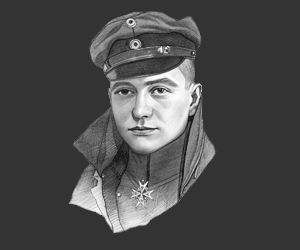 He was, at the same time, also a good marksman who would typically dive from above, with the advantage of attacking with the sun behind him and using Oswald Boelcke's air-combat tactics which are now referred to as the "Dicta Boelcke". Richthofen's most famous victory took place on the 23rd of November 1916, when after a long and difficult dogfight in his Albatros D.II, he shot down and killed the British fighter ace Major Lanoe Hawker VC in his Airco DH.2 fighter. The adversaries had been well matched and prior to Richthofen going to claim Major Lanoe Hawker's machine gun as a prize, he is reported to have said he needed a new plane. 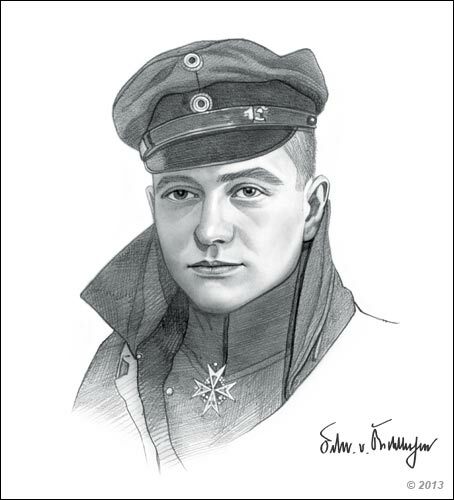 As a result of his victory over Lanoe Hawker, Richthofen received the Pour le Mérite (also known as “The Blue Max”) in January 1917, the highest military distinction in Germany at that time, shortly after his 16th confirmed kill. In the same month, he assumed command of Jasta 11, which included some of the elite German pilots who he personally trained and included Ernst Udet, Hermann Göring and the Red Baron's younger brother, Lothar von Richthofen. It was when he became a squadron commander that Richthofen had his Albatros D.III painted red and from then on flew with a red or part red-painted aircraft, earning him the title “Red Baron”. The Red Baron led Jasta 11 to unparalleled success, downing 22 British aircrafts in only a month. By June 1917, he had become the commander of a larger Jagdgeschwader (wing) formation, leading Jagdgeschwader 1, which was a highly mobile tactical unit that could move to different parts of the front as required. JG1 later became popularly known as “The Flying Circus” or the “Richthofen Circus”. On the 21st of April 1918 whilst flying his red Fokker DR1 Triplane, Richthofen was hit by a single .303 bullet, which was officially credited by the RAF to Captain Arthur Roy Brown who was flying a Sopwith Camel. The gun shot severely damaged his heart and lungs, and is speculated to have produced a speedy death. Before Richthofen breathed his last, he was still able to make a landing in a field north of Vaux-sur-Somme, in a sector controlled by the Australian Imperial Force. According to Sergeant Ted Smout of the Australian Medical Corps who rushed to Richthofen’s aircraft, his last word was “kaputt”. Considerable speculations and controversies still surround the facts regarding Richthofen’s death, however, including the possibility of him having been killed by Australian machine gun fire from the ground. By the time Richthofen died, he was already considered a legend, causing considerable fear that his death would demoralize the German people. He has thus become a part of a cult of hero-worship, which was encouraged by official propaganda. Rumours over-enlarging his achievements and the value placed on him by the enemy were circulated; to the point that Richthofen’s correspondence actually shows that he may have believed the rumours himself. As such, there has been considerable debate with regards to aspects of his career and death. In consideration of his achievements and fame, Richthofen was regarded with the highest respects even during his death. In fact, a full military funeral was conducted for him by the personnel of No. 3 Squadron AFC. He was buried in the cemetery at Bertangles. In the early 1920s, he was transferred to Invalidenfriedhof Cemetery in Berlin, upon request of the German government, and received a state funeral. In 1975, his remains were moved to Südfriedhof in Wiesbaden. This picture of Manfred von Richthofen - The Red Baron is Copyright © June 2014 Siteseen Ltd. We only authorise picture use and particularly encourage it's use for printed educational non-commercial purposes. This Manfred von Richthofen - The Red Baron picture is not in the Public Domain. 2) Not for internet use. 3) Use of this Manfred von Richthofen picture, or any of our pictures on websites re-distributing copyright free material is strictly prohibited.